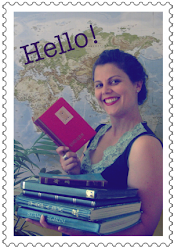 Happy New Year, Sunday Stampers. This is my first time participating in Sunday Stamps for 2013 - and it is almost February! The theme this week for Sunday Stamps this week is "cartoons and cartoon-like drawings." I have to admit that generally speaking, I don't usually rate cartoon stamps. They are just not really my thing. However, flicking through my album, I found these stamps from 1994, which I still quite like. I think I liked them very much back in Year 8, when I got them. They depict the mythical creature, the Bunyip. 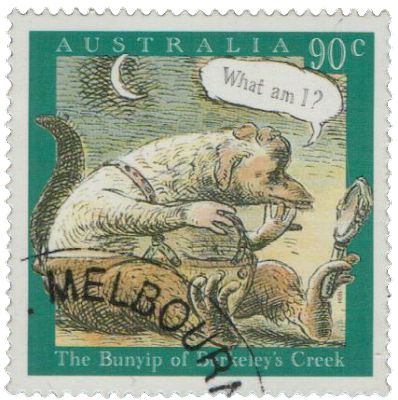 The Bunyip from Berkeley's Creek is a classic Australian children's story book and features on one of the stamps. I still get a pang of sympathy for the poor misunderstood Bunyip from Berkeley's Creek when I think about him. Needless to say, this is my favourite stamp of the four from the issue. I have the stamp pack for these stamps, because I thought stamp packs were cool when I was in Year 8. 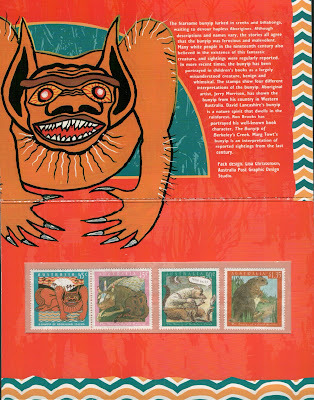 The first stamp is a representation of the bunyip from Aboriginal myth, the second is one called the "Nature Spirit Bunyip". 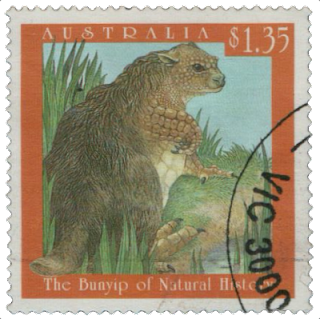 The last stamp is an artist's interpretation of reported sightings of the Bunyip, so is the depiction of the "Natural History Bunyip". The more I reflect on these stamps, the more I like them. I love a good mythical creature. Happy Sunday, everyone... and beware of the bunyips out there. I hadn't heard of the Bunyip before, thanks for sharing :). 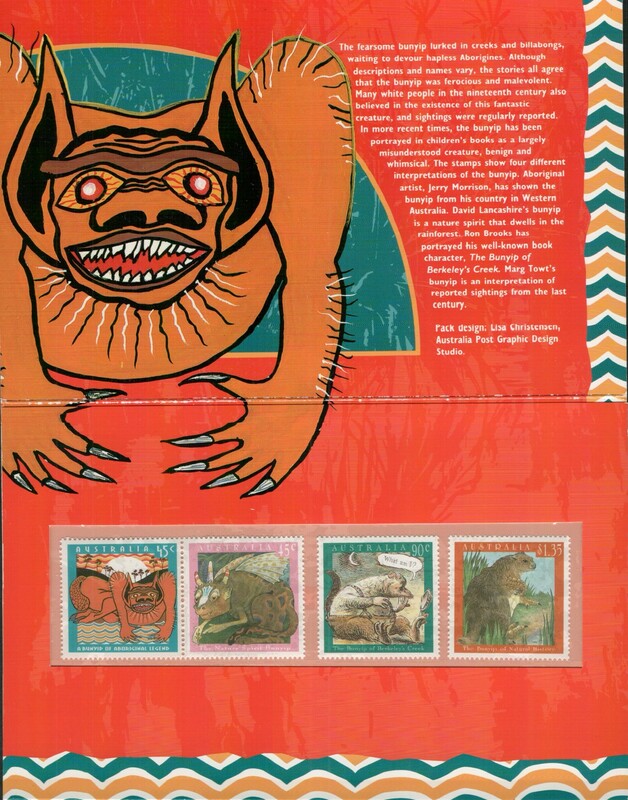 Interesting stamps, I like mythical creatures, these are new ones to me too. I now know what to look out for by the billabong. New to me too! Very interesting. Thank you for sharing. With animals like the duckbill platypus in Australia I can readily believe the Bunyip exists. Fine stamps. something new for me too, very interesting! For those who are world weary, it is lovely to think there are still things out there that people haven't heard of and can bring some delight, even the humble bunyip....I'm guessing that those who haven't heard of the bunyip of Australian mythology, must not have had their formative years in Australia. 'The Bunyip of Berkley Creek' is certainly an endearing character. the name bunyips sounded vaguely familiar. I must have read something as a child as I recall some bits from reading about them on wikipedia. This has been a fun theme - remembering the comic drawings and shows of a long past childhood!